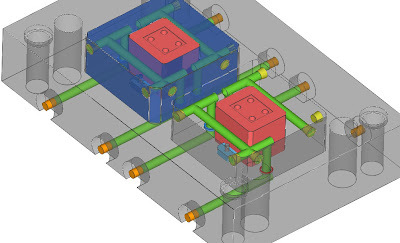 here the basic construction of joining cavity cooling and mold base cooling, we can use from simple construction to joint cavity and mold base cooling with one O ring, or we can use more complex construction like using special plate, and various O ring seal type. 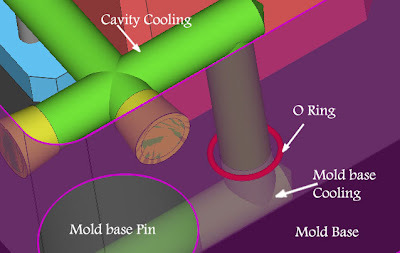 here is basic construction to joint the cavity cooling and mold base cooling. 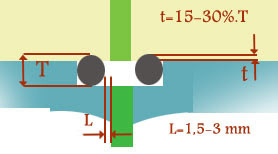 at the cross section of cavity and mold base cooling construction, blue color indicate mold base part, and light yellow indicate cavity block, green is indicate hole or pipe of cooling. light black is O ring before penetrate with cavity block. however is the simplest construction to join cooling cavity and mold base.